ISSA PHYSICAL THERAPY: Why Water is Great! We have all heard that is important to get enough water during the day, yet it can sometimes be a struggle. An excuse I get often from patients, and one I can relate to, is that there isn’t enough time during the day to be able to go to the bathroom if they drink the required amounts of water. One way I try to combat this issue is that I drink water in the morning knowing that I can go to the bathroom before I start work. I then drink glasses of water an hour or so before I know I will have a break. On my drive home, I then drink more water to prevent having to drink a lot of water before bedtime. What works for me, may not work for you, but try and find a routine that will allow you the ease to get in the water you need. There is no standard of how much water we should drink daily as some say that 8, eight-ounce glass of water a day is sufficient where others state that you should get half to an ounce of water per pound of body weight. However, depending on how active you are, how much caffeine and/or alcohol you intake, where you live (hot environments), your metabolism, and how much you sweat during the day, you may need to drink more than this. A good way to know if you are drinking enough water, is that your urine will be clear or very light yellow. The darker and more scented your urine, the more dehydrated you may be, or there could also be other issues going on with your body. The adult human body is made up of 45 - 60% water differing for males and females due to females having more body fat than men (this is for normal, healthy female). As you can see, water is a major component of our body and is essential for keeping our bodies working properly. There are many benefits to drinking enough water throughout the day that I hope will help you become more serious about your overall wellness and begin replacing sodas, coffee, juices, and other drinks with water. Water enhances brain function. Just a 1-3% loss of body water (this is easily done with daily activities, and definitely in high heat and during exercise) can result in impaired brain function, mood, energy level, concentration, and memory. Water also aids in the production of hormones and neurotransmitters, which are very important for proper body functioning. Blood is 90% water and is what carries oxygen throughout our body. It helps keeps our joints lubricated. Cartilage lines our joints and discs of our spine. It is made up of 80% water. A lack of water in cartilage can cause it to become less lubricated, decreasing its shock-absorbing capabilities. Our digestive system requires water. Dehydration can cause constipation, heartburn, and increased acidity of the stomach (which can increase the risk of stomach ulcers). Water helps our body get rid of wastes. A lack of water can increase the risk of kidney stones and problems. Water forms saliva that aids in digestion of food, reduces tooth decay when replacing sweet beverages, and helps keep our eyes, nose, and mouth moist. Poor water availability can prevent minerals and nutrients from making it to their needed destination in the body. Physical Performance enhances with water. Losing just 2% of body water (athletes usually do 6-10%) from sweat can change your body temperature, decrease motivation, increase the work effort, and cause more fatigue. Muscle is 80% water and needs the oxygen that water can deliver to prevent stress. Our skin stays healthier and less susceptible to skin disorders with good water intake. Water is good for weight loss. Drinking water before meals may reduce the risk of overeating as it will provide a sense of fullness before you start eating. Furthermore, water in place of sweetened drinks will also help with weight control. 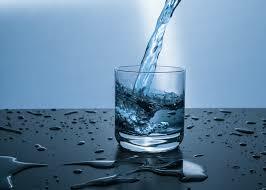 Drinking cold water requires more energy to heat the water to body temperature thus burning a few extra calories. Shaw, G. 2009. Water and Your Diet: Staying Slim and Regular with H2O. Reviewed by Nazario, B., M.D., WebMD.com. Leech, J., MS. 2017. 7 Science-Based Health Benefits of Drinking Enough Water. https://www.healthline.com/nutrition/7-health-benefits-of-water.